Best Mattress For Sciatica: Get Proper Support From Your Bed! Why Is It Important To Find A Good Mattress if You Have Sciatica? Many factors can cause sciatica, but a bad mattress always makes it worse. Bad mattresses create spinal conditions that cause nerve pain. They make your symptoms worse overnight. Sciatica pain can interrupt your sleep. If pain is waking you up, or getting worse in bed, don’t worry! You don’t have to suffer any longer. We've found the best mattress for sciatica. Your life is about to get better. No more sleepless nights. Our research team has compare notes. They've created a list with the best beds for sciatica sleepers! We’ve ended up with three recommendations to show you. Each bed fits different budgets, sleeping positions and comfort preferences. Below, we’ll introduce you to our three recommendations with our own in-depth reviews. We’ve also come up with a quick guide to shopping for mattresses when we’ve got sciatica, so you know what to look for. Why does Sciatica demand a Good Mattress? Sciatica is a pain condition caused by pinching or irritation of the sciatic nerve. In addition to pain, it causes numbness, tingling, or other abnormal sensations. Most commonly, it’s the result of a spinal issue, like a slipped disc, herniated disc, or spinal degradation. All those causes are made worse by a sleep surface that doesn’t relieve pressure in the hips and lower back. They are also aggravated by a a sleep surface that causes unnatural curvature in the spine. Having too firm or too soft a bed can be one reason you’re experiencing sciatica to begin with. Your bad mattress prevents you from recovering. Instead of a restful night that restores your body, you get interrupted sleep and pressure on your nerves. The best mattress for Sciatica relieves back and hip pressure while aligning your spine. The beds bellow will fit that bill. The Sleep Innovations Shiloh is our best bed for sciatica. The Sleep Innovations Shiloh is the least expensive mattress we recommend for people with sciatica. It’s half the price of our other recommendations, but, gives you plenty of bed for your dollar! It’s 12” thick with a sturdy support core for keeping your spine aligned and a top comfort layer for relieving painful nerve pressure. It covers the essentials for relieving overnight sciatica symptoms at a low price! The Sleep Innovations Shiloh is rated by its manufacturer as a “medium” mattress, but we would categorize it as closer to a medium-firm. Previous buyers said that while it felt quite firm at first, it quickly molded to their body contours. They appreciated how it distributed their weight evenly, to relieve pressure and keep their spine aligned. Those are all the key factors for reducing sciatica! It uses dense foam, which is apparent in the weight. This weighs 10-20 pounds more than other mattresses at this size! We appreciate the denser foam for supporting your spine especially if you’re a heavier person. Heavier buyers were impressed by how well this bed held up under their weight, when other budget beds had simply sunk in. The extra density makes this more supportive than other budget options. Definitely the all the lumbar support for sciatica that you will ever need. It has a simple two-layer design.The top 2.5” are an adaptive comfort foam, and the bottom 9.5” are a sturdy base foam. Since the whole thing is 12” thick, there’s a lot of real estate to work with. That’s a big advantage over the 6” and 8” mattresses you usually see at this price point, which don’t have enough room for a thick, sturdy base layer. It’s made in the USA by an established company. A lot of factory-direct mattresses you find online these days are from companies who are jumping on the bandwagon. They come and go, and very few of them make more than subpar beds. By going with an established brand like Sleep Innovations, you can be assured that warranty coverage will be honored, and that all those glowing reviews aren’t just a fluke. Since the mattress is made here in the USA, you can also expect much better quality control that you’d see from imported makers. The foams are CertiPur US certified to be free of harmful chemicals and flame retardants. It’s covered by a 20-year warranty. Most reviewers found that their beds held up very well over time. They only noticed slightly softer surface foam after several years of use. Other budget mattresses break down very quickly. Buyers had mixed experiences with longevity. While the vast majority said their mattresses held up perfectly well for several years, a few reviewers noted that their beds had noticeable soft spots after a year or so of use. While there’s a long warranty, it’s not exactly hassle-free. As with a lot of foam bed warranties, the Sleep Innovations warranty specifies that you have to have a 1.5” dent to make a warranty claim. That’s a pretty significant soft spot, and most buyers who noticed soft patches said they didn’t want to sleep on an uncomfortable mattress long enough to meet that measurement. It doesn’t have any cooling features. This is a “neutral” temperature mattress, not a “cool” sleeper. We didn’t hear too many complaints about heat from reviewers, but if you have problems with heat as well as sciatica, you may want to spend more for something with cooling gel or ventilation channels. Some people found it too firm. Since it does have a relatively shallow comfort layer, it might not be ideal for all side sleepers. The Tuft & Needle is one of the most popular mattresses on the market right now. Since it’s relatively firm and remarkably comfortable across sleep styles and health conditions, we think it makes an excellent choice for people with sciatica. 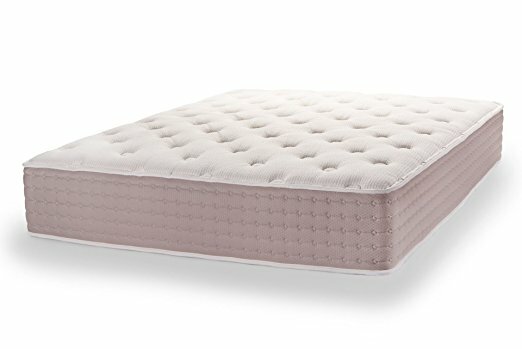 It doesn’t cost much more than the Sleep Innovations, but it offers superior durability, heat mitigation, back support, upper back support, and pressure relief for side as well as back sleepers. ​In our opinion, one of the best for sciatica pain relief, the Eco Terra Luxury mattress lands a spot on our list. It is extraordinary if you are looking for back support for sciatica pain especially at night. It’s on the firmer side of the Sleep Innovations, but it still manages to be comfortable for most side sleepers! Like the Sleep Innovations, the Tuft & Needle has a two-layer foam design for a balance of cushion and support. The top 3” are comfort foam, which is an adaptive, proprietary material that acts like memory foam but with more of the bounciness and quick response of latex. The lower 7” are a dense comfort foam for spinal support and alignment. We think the Tuft & Needle is more comfortable for all sleep styles thanks to the special foams. Unlike the traditional memory foam that’s used in the Sleep Innovations mattress, the Tuft & Needle’s comfort foam has gel integrated, so it doesn’t give you a sinking feeling or allow your spine to curve. It’s much more supportive through the lumbar and torso, which makes it a better choice for sciatica. Since the comfort layer is slightly deeper than the Sleep Innovation’s, it’s easier for side sleepers to enjoy as well as back sleepers. It sleeps much cooler than the Sleep Innovations, thanks to the gel and charcoal that’s woven into the top layer of comfort foam. Very few reviewers had issues with overheating, even in particularly warm climates! Between the cooling materials and the outstanding balance of cushion and support, the Tuft & Needle has earned some of the best reviews of any mattress on the market. It’s won praise from professional testers, average buyers, and especially people with chronic issues like sciatica. Like the Sleep Innovations mattress we’ve just looked at, the Tuft & Needle is made entirely in the USA. The foam components are CertiPur US certified, and the glues have also earned an OEKO-TEX rating for non-toxicity and environmental friendliness! One big advantage this bed has over the Sleep Innovations and other foam cushions is that it has a non-chemical fireproof fabric sock liner, instead of toxic flame retardants. It meets fire code without off-gassing toxins! It’s covered by one of the most generous comfort guarantee periods on the market! You get a full 100 days to try out the mattress at home without having to worry about paying to ship it back if it doesn’t quite work for you. It’s also covered by a 10-year warranty. In dealing with both the comfort guarantee policy and the warranty coverage, buyers reported outstanding customer service and support from Tuft & Needle. The company is prompt to respond to concerns from buyers, and has a hassle-free policy for returns, refunds, and exchanges. It’s a pretty firm mattress. We like that for sciatica, but some people, mostly side sleepers, may find the firmness too much. Some initial critics of the Tuft & Needle thought it was simply too hard, but the company has tweaked the most recent version to be a bit softer without losing spinal support. We think it’s a great fit, but if you need more of a cushion-y sleep surface, you may disagree. Quality control and customer support from Tuft & Needle seem to be exceptional. However, as with any foam bed that ships rolled up to your door, the occasional buyer ended up with a mattress that expanded unevenly or had some other slight defect. That’s always annoying, but Tuft & Needle have gone out of their way to make things right for those buyers, which is why most of them ended up leaving glowing reviews. Our most expensive mattress recommendation for people dealing with sciatica is this EcoTerra. It’s a medium-firm bed that’s a bit more forgiving than the Tuft & Needle for side sleepers, while maintaining all the spinal support back sleepers need. It combines two great cushion materials, using the adaptive quality of latex foam and the durable support of coil-wrapped springs. We think it’s a fantastic mattress to begin with, and it’s also perfect for people dealing with sciatica. 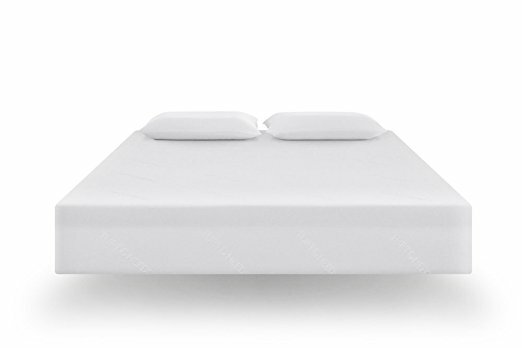 It’s a hybrid mattress which combines a spring base and a latex foam comfort layer on top. So, is it the best mattress for sciatica back pain? Honestly, it does belong in the top 3 but we will leave it up to you to decide. This isn’t a traditional spring mattress, though. The EcoTerra’s springs are all individually-wrapped, which helps them isolate movement extremely well. They also won’t wear out like traditional spring beds, so you don’t have to worry about a big saggy spot in the middle of your bed. We like coil-wrapped springs because they’re as quiet as foam, but they do a better job at giving your spine anatomically-correct support. 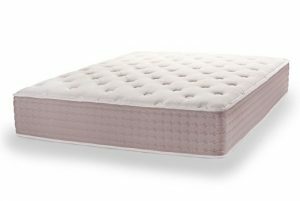 The latex foam comfort layer on the top of the cushion gives you the adaptive, molding qualities of memory foam, but with more bounce. The springier quality of latex means that this foam doesn’t give you the sinking feeling of memory foam. That’s a huge asset in resolving sciatica, because it allows the foam to support your lumbar and thoracic spine at the same time it relieves pressure on hips and stomach. The spring and latex combination does an excellent job at supporting spines through the torso and lumbar, whether you sleep on your back, side, or stomach. Reviewers overwhelmingly thought this was the most comfortable mattress they ever slept on! Buyers with all sorts of chronic pains like sciatica said they felt like they were getting a firm but supportive hug when they lay on the EcoTerra! While it’s just as supportive as the Tuft & Needle, it’s a more luxurious sleep experience. People that are trying to learn how to sleep with sciatica back pain will certainly like this product. The Tuft & Needle has fairly impressive ratings for durability, but synthetic foams tend to break down more quickly than the latex and spring materials used in the EcoTerra. We would expect this one to last somewhat longer than any foam bed. The manufacturer says the bed should remain supportive and comfortable up to 25% longer than memory foam! As with the Tuft & Needle, it’s made entirely in the USA from non-toxic materials. All of the latex used in this bed is from plant sources, and the cover material is organic cotton. The whole thing is much less smelly than memory foam mattresses, and safer for your lungs as a result. It’s covered by a 10-year warranty. We also found that reviewers gave it excellent marks for durability over extended use. In fact, we couldn’t find any complaints about sagging spots or lost firmness! It’s very expensive compared to our other recommendations. Even though the EcoTerra is still a fraction of the cost you’d pay for a TempurPedic or other big brand name mattress, it costs more than twice as much as the Sleep Innovations, and several hundred dollars more than the Tuft & Needle. It doesn’t come with as long of a comfort guarantee period as the Tuft & Needle. You’ll only have 30 days to try out the bed before the purchase is final. With any acute pain symptom, your first priority is always to reduce or eliminate the pain. So, you’ll want some pressure relief in the top layers of your mattress. If you’re a back sleeper using an old, hard bed, you may have chronic lumbar pain. That can be contributing to your spinal issues and sciatica. You’ll want a mattress which allows your hips to sink slightly into the cushion to relieve pressure. When a bed is too firm, the hips stay above the surface of the bed, which causes lumbar curvature. You’ll avoid that when you buy a bed that allows some contouring at the hips, while being springy enough to support the lumbar at the same time. Either memory foam or latex materials tend to be the best for this. Side sleepers need much the same thing: a cushion which allows contouring at the hips and shoulders, only slightly deeper than a back sleeper because of the way the body is positioned. The key is to keep your spine straight with a mattress that contours at the pressure points but remains supportive through the lumbar and thoracic areas. It can be tempting to think that since you’re experiencing pain, you need a super soft mattress to relieve pressure. However, pressure relief is as much about spinal alignment as it is about cushion! Since your pain symptoms are the result of spinal issues, you should focus on finding a bed that keeps your spine straight and long, not curved or crunched. So, we recommend that people going through sciatica stick with medium-firm or firm beds. Some side sleepers may need something closer to medium, but you should consider medium-soft and soft cushion support. Try to find a level of comfort according to your sleeping position, without allowing your spine to curve beyond level. Now that you’ve finished reading this guide, you should be well on your way to relieving your nighttime sciatica symptoms! If one of the mattresses we’ve recommended here strikes your fancy, all you’ll have to do is click on one of the links in its review to learn more and check the price! Or, check out our homepage for even more in-depth reviews and comparisons of the best mattresses on the market! Which of these beds should you buy for your sciatica? 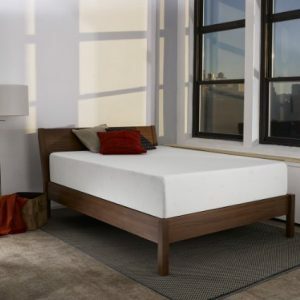 The Sleep Innovations mattress is the obvious choice for people shopping for a new mattress on a budget. It’s half the price of the Tuft & Needle, and 1/3 the price of the EcoTerra! While it doesn’t have as cool a construction or as comfortable a support layer as our other choices, it will provide all the key comfort elements you need for sciatica at a very low price. However, you shouldn’t expect it to last more than a few years, and it might not be a great choice for some side sleepers. The Tuft & Needle is an excellent midrange option for sleepers in all positions. It’s got all of the Sleep Innovations’ support with some extra comfort depth for side sleepers. We love the firm but responsive comfort foam, with the gel cooling and extra bounciness. It’s really ideal for sciatica. On the downside, this is certainly a firm mattress, so if you’re not prepared to go beyond medium-firm, you may want to choose the EcoTerra. The EcoTerra is also likely to last longer, given the spring and latex construction. Given the long comfort guarantee, though, we think that if you’re thinking about the Tuft & Needle you should at least give it a try. We think the EcoTerra is the best overall in practically every department. It’s the most durable of the three, and we think it combines the best of traditional and modern mattress-making techniques. It’s soft enough to satisfy just about everyone, but the springs and resilient latex give it ample support for your spine to reduce sciatica symptoms. The only downside is the price. If you can afford it, go for it! We don’t think you’ll be disappointed.